A celebration of beauty is the purpose. The enduring precise exact beauty of five cars that have delighted the eyes of so many and celebrated all the senses of so few, deeply, deeply fortunate men. Unconventional though, for the Atlantic the voluptuous overripe sensuousness of a Teardrop Talbot-Lago would be superfluous, nor could the serene elegance of a Delage Aerosport sooth the urgent intensity. Just look at that profile of the Atlantic; the roofline’s dramatic plunge down towards where the rear fenders meet with such economy of line, and then, just for a moment, revel in the tightness of it all. Let your eyes delight in that central spine and the same motif defining the wings; never before has the simple act of joining two metal panels been so utterly indistinguishable from high art. It is this enduring beauty I wish to celebrate. Caveat: should you be in the lucky position to own a copy of Mr. Pierre-Yves Laugier’s Bugatti 57 Sport, you will find nothing new here. But should you not, I have tried to provide you with the highlights of the rather magical tale of the Aerolithe and her four daughters. Author’s note: After finishing this essay, I found that the author L G Matthews jnr. has already covered the story of the Atlantics in a book titled : Bugatti Yesterday And Today – The Atlantic and Other Articles. Probably a good thing I discovered this after I wrote mine, otherwise I would have lacked the courage to revisit a subject so expertly explained by a researcher and historian of Mr. Matthew’s caliber. And just to really drive the point home, most of his research was done by interviewing, well, everyone, it seems. And , of course, by careful study of the original factory documents. Mr. Matthews was there; he touched the cloth; then he wrote. Myself, on the other hand, merely read some books and then, quicker than you can say ‘Plagiarist!’ self delusion convinced me I can write. Kindly keep that in mind should you choose to read on. The Aerolithe broke cover at the Paris Salon of 1935. Painted silver-gray , fitted with chrome wire wheels and Dunlop whitewall tires, it completely overshadowed 57222; a rather gaunt looking roadster which was, however, the real genesis of the 57S. Which brings me rather conveniently to the vexed question of which chassis type was used for La Aerolithe. Laugier is of the opinion that the tapered type chassis was used; Simon allowing for the use of the standard T57S chassis. They are both wrong; the Aerolithe (and yes, there was only one – more on this later) was built on a shortened T57 Normale chassis but shortened to 57S length. I am of the opinion that the Aerolithe was essentially a styling concept, a search for a new look for what was to prove to be the last Grand Sport Bugatti. This would also explain why (a): those who drove in it, all commented on the silence and freedom of traffic and mechanical noise (Serene silence is not a term applicable to the Atlantic, I believe) and (b): why it was broken up. According to Laugier, Robert Aumaitre, Bugatti’s chief mechanic in charge of the racing cars, told historian Robert Jarraud that it was broken up. This makes sense, created for styling and with this look successfully transferred to the Atlantics; and being of no technical interest, it served no purpose anymore. So yes, I believe that to be the reason it was broken up. A few discrepancies remain though. Especially at the front, the location and height of the radiator in particular. Some of the images suggest that the radiator was situated behind the front axle, but this could also be explained by the extreme forward position of the headlights and the tunnel effect created by the way the front wings surge up against the side of the radiator. If the radiator was placed further back though, does this mean that engine and bulkhead both are also further back? And was the bonnet, bulkhead and radiator lower than those of a standard car? Answers please Mr Grainger and some more photos, especially of the finished car. Pretty please? I trust that you have avoided the many pitfalls that have befallen the failed German attempt to build an authentic looking Aerolithe. Have you all seen that pale blue abomination? Their unworthy backs are just crying out for the cruel lash of the whip! And then hang them. You see, this is what happens when the Atlantic is used as starting point for an Aerolithe recreation; it ends up a crime against humanity. As for the color used, words fail me. Let yours be right Mr Grainger, for the sake of our salvation, let yours be right. Dr Bernard Simon is of the opinion that there was two Aerolithes and that their coachwork, suitably adapted, was used to clothe the first two Atlantics. In the process he dismisses as insignificant the quite extraordinary existence of the fourth Atlantic (57543) and further compound matters by accurately differentiating it from the Holtzschuch Atlantic (57473). Dr Simon devotes an entire chapter, titled “The Metamorphosis of the Competition Coupe Aerolithe to the Coupe Aero and to the Atlantic” to try and prove that the two cars, whose separate identities are argued in a preceding chapter titled “The Type 57S Competition Coupe, Nos. 57.331 and 57.103S”served as providers of the coachwork that ended up on chassis 57374 and 57453. Dr Simon argues that apart from the lower bonnet line and subsequent deepening of the windscreen the Atlantic is identical to the Aerolithe. This is simply not true and I am afraid Dr Simon has done his reputation no good by clinging so stubbornly to his incorrect interpretation of evidence to the contrary. This author is prepared to state, with some conviction, that there was only one Aerolithe. I accept that when the Aerolithe was unveiled at the Paris Salon of 1935 it carried chassis number 57331 and its engine bore the number 226S. I further accept that the factory mixed and matched identities at will, more often than not simply to get them road registered. 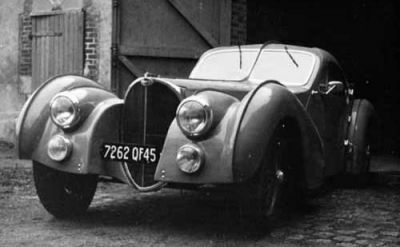 The identity 57331 was given to Jean Bugatti’s personal black and red long chassis Atlante, initially carrying chassis number 57333, when it was sold to Mme Travers on the 14th of May 1936. It still kept engine number 234 and there can be no doubt that this Atalante had nothing to do with the Aerolithe. Dr Simon’s work serves as a salutary warning of the danger of falling in love with a theory and then attempting to research it true. Delivered to its first owner, Lord Victor Rothschild on the 2nd of September 1936, this is the metallic blue beauty that would become the 2003 Car of the Show at the prestigious Pebble Beach Concours. Owned since 1971 by Dr Peter Williams it was only after he won at Pebble Beach that I finally thought I knew the history of all the Atlantics. Not my first wrong assumption as far as Bugattis are concerned, and, I dare say, it wont be my last either. But before we get to 57374’s fascinating history I wonder if I may persuade you to take a moment and look at some of the images taken of her since her 2003 triumph. Observe how the light dances over those sharp creases and caress the softer curves. Notice how that beautiful metallic blue hue exposes the many subtle curves and lines, and then hides them again depending on how the light catches it. Mesmerizing is it not? “Age shall not whither her” indeed. Ordered by Lord Rothschild on the 23rd of March 1936 and completed on the 31st of August, it was driven from the Bugatti factory to England by Edouard Mischall, a representative of Bugatti’s London Agency, but not before Jean Bugatti took the first known photographs of 57374. He shot them in the factory courtyard, shortly before it left to be delivered to its new owner. Registered DGJ 758 in September (On Jean’s photographs the temporary factory number 6559-WW20 can be seen) this car was owned by Lord Rothschild until October 1941, when it was sold to Mr. T P Tunnard-Moore. Laugier quotes Lord Rothschild’s son, James Amschel Mayer as saying that his father maintained that he abandoned it in a field when the engine exploded. This might explain why the car, upon being sold to its new owner was described as: Needing certain repairs! Not a sentimental man then. A few owners later, around 1944/5, the car was sold to Bob Oliver, a wealthy American doing duty in the Medical Corps of the US army. Around 1946 (Laugier states 1947) Mr Oliver exported her to the United States of America thereby making this the first transatlantic 57S. So endeth the first chapter of 57374. After making contact with Charles Renaud, (owner of 57383; now in the Schlumph collection) he provided confirmation, the factory’s protestations to the contrary notwithstanding, that it was indeed possible to fit a Cotal gearbox and this was duly done, (probably by Bugatti mechanic Henri Hauswald, who fitted one to 57383) hydraulic brakes was fitted. (also by Hauswald?) and was then sent back to California , where Mr Oliver used the car rather sparingly and in 1958 it was retired and put into permanent storage. Mr Oliver died in September 1970 at the relatively young age of 50. Shortly before his untimely demise Mr Oliver had one last chance to drive 57374, when that great American sportsman Mr Briggs Cunningham, asked to exhibit Mr Oliver’s car in his Costa Mesa Car Collection. Auctioned by Sotheby’s Los Angeles on 12 June 1971, it was sold to Dr Peter Williams. Simon says (sorry – I mean I apologize) for 60 000 dollars; Laugier states 70 000. By the way, on pp91-92 Dr Simon has reprinted the article covering the sale, which appeared in Pur Sang Vol.13 no 1 (Is this the American Bugatti Club’s Bugantics?). For thirty years Dr Williams has owned, loved and used 57374 and then decided, as one does, to have it restored for Pebble. Between 2001 and 2003 Jim Stranberg and Scott Seargent carefully and with exquisite sensitivity slowly returned 57374 to the way she looked when delivered to Lord Victor Rotschild during March 1936. When the organizers of the Pebble Beach Concours decided to celebrate Bugatti in 2003, 57374 was ready to imprint itself on the public’s consciousness all over again. With the final Atlantic 57591, and itself the 1991 Car of the Show, looking on, Dr Williams drove her onto the ramp and to loud and heartfelt applause became the second Atlantic to be reverenced at Pebble. And the very next day Dr Williams started using her with as much enthusiasm as he did before her restoration. I have seen many photos of Dr Williams with 57374 and on every one he has the look of a deeply contented man. Somehow this matters to me a great deal, the man loves his car. O yes, it matters a great deal indeed. To summarize: Born in 1936, 57374 has been loved and cherished by all her owners and exists today as one of two exceptionally original Atlantics, but 57374 has been repainted in her original livery, while 57591 has to suffer the indignity of Ralph black. Pale blue-gray metallic, with blue leather seats, still carrying the registration plate DGJ 758, 57374 is , in the opinion of this author, the most desirable 57S, if not the most desirable Bugatti ever. Dr Williams you are a very, very fortunate man indeed! This is the fabled “new” Atlantic discovered by Pierre-Yves Laugier. Reading and rereading Laugier’s chapters on 57453 and 57473 I am struck by the comprehensive research and the sensitive interpretation of these facts. I still fervently maintain that these two chapters alone, firmly places the esteemed Mr Laugier as the pre-eminent Bugatti historian of our time, yes, even more gifted than Conway. He really is that good. What follows is the result of this man’s research; all I did was to acquire a copy of Bugatti 57 Sport. 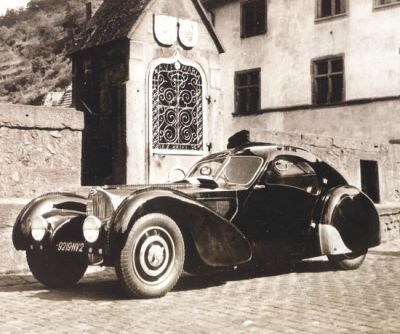 Now for the real bombshell; all the photos you have seen of a black Bugatti Atlantic (The 1938 catalogue and the ones taken in the forests of the Vosges for instance) are of this car, but attributed to 57473. This happened due to the belief that no photographs exist of 57473 , making any comparisons impossible. Laugier has now found images of the Holzschuch Atlantic (pages 110 & 113) and it can be seen at a glance that they are two different cars. But let us now concentrate on the car that started life as 57453. Kindly note that I took the above inscription from Alexandria Taylor-Fatio’s English translation of Mr. Laugier’s original text. (page 107) This alone would be convincing enough, but Mr. Laugier goes further by carefully comparing the dates where these two cars are known to have appeared. A brief summary of these dates: 57473, picked up by Mr. and Mrs. Holschuch on 13 December 1936, was entered in the Cote d’Azur Concours D’Elegance on the 31st of March 1937 (see following chapter) while 57453 was being exhibited at the Nice Automobile Show of 1937; April 8 to April 18. Seen together with the photographs taken, the evidence that there was indeed four Atlantics is nothing short of definitive. Take a bow Mr. Laugier, the honor is yours. 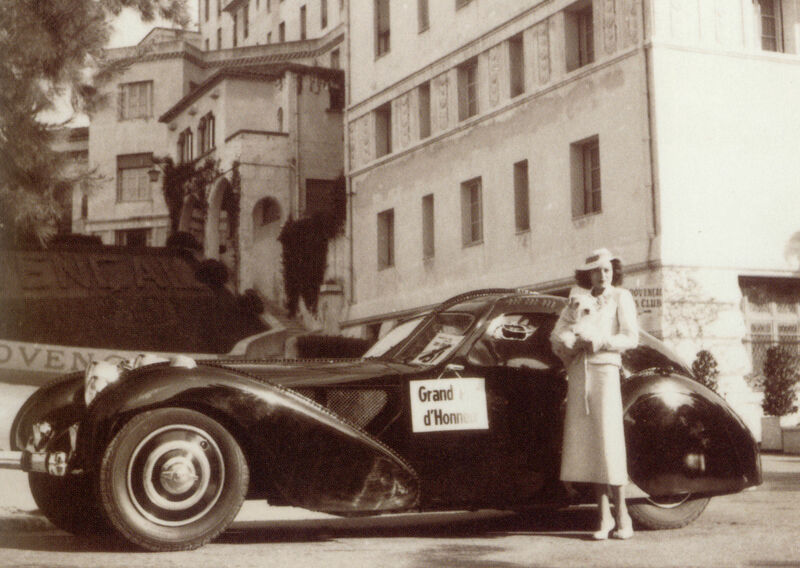 This car would seem to have led a rather busy life, used frequently by Jean Bugatti and given to both Robert Benoist and Mrs.Yvonne Williams for their own personal use. I agree that finding photographs of a black Atlantic in a magazine called “Sport Canin” is somewhat unexpected, but explained by the fact that Mrs. Williams was a well-known breeder of Scottish Terriers. Two of the little darlings appear with Mrs. Williams in the photos I’ve seen. By the way, Dr Simon makes the most extraordinary claim on page 55: “One detail in this picture is that the car has no chromium-plated mudguards on the rear wheel houses.” Clumsy translation notwithstanding, I respectfully submit that it cannot be determined whether the car was fitted with these chrome embellishments or not due to their location being obscured by the dark skirt worn by Mrs. Williams. Oh dear. So what happened to Atlantic no 2? The last known reference is on a list of cars that was due to be sent to Bordeaux in February 1941, described as: “Engine 2CS, 57454, Atlantic Coupe 1244 W 5” And then she disappeared. Can a car this fabulous remain hidden for sixty seven years? That would depend on whether there is a barn left in all of France that has not had a historian search its contents, I suppose. At least her beauty lives on in those exquisite photographs by Rene-Jaques. For as long as those images continue to stir the imagination, she will never die. In my dreams 57453 lives on. Jacques Holzschuch took delivery of Atlantic 57473 on the 13th of December 1936. His car left the works on the 1st of December, was registered with the registration plate 3924 RK 7 on the 9th and was delivered to its owner on the 11th , but there still remained some road tests to be completed, so the actual delivery date is therefore the 13th of December 1936. On either the 13th or the 14th Mr. and Mrs. Holzschuch left for Paris. The following year, towards the end of March, while holidaying on the French Riviera, the couple entered 57473 in the Juan-les-Pins Concours d’Elegance. Here, parked in front of the Grand Hotel Provencal, the only known photographs of 57473 were taken. How these photographs came to light is quite interesting. I quote Laugier: “Then, the skilled historian, Jean-Pierre Cornu, specialist of the Cote d’Azur Concours d’Elegance (the subject of his future book) showed us an article which appeared in the April 1937 “Revue de l’Automobile Club de Nice.” There was a photograph of Madame Holszschuch at the Juan-les-Pins Concours D’Elegance taken on March 31, 1937 beside Atlantic 57473S and in front of the Hotel Provencal. The photo showed that the Holzschuch’s Atlantic had two large chromed headlights on the front fenders, two small fog lights, two double blade bumpers and a 1936 Paris registration.” To this I can add that further differences reveals itself, nowhere more so than with the central spine. When compared with 57453 the spine stands considerably higher, all the way from the front of the bonnet, past the windscreen and up and over the roof. It would also seem that the rake of the windscreen is slightly steeper than the others, although this might be an illusion created by the spine’s more elegant curve from the back of the bonnet to the bottom of the windscreen. Something I do not understand though, concerns the rear fender; attached to the spine running along the edge of the rear fender, roughly above the rear axle, is what appears to be a most streamlined bullet shaped rear light. What purpose did it serve? Indicator or rear light? Jacques Holzschuch died towards the end of the war, Laugier suggests 6 December 1945. This rings true, as does Mr. Laugier’s assertion that the car was not modified while in the possession of its first owner; these changes being effected in Cannes or Monaco probably shortly after the war ended. Figoni has been mentioned as the coachbuilder, and several sources claim these modification to have been effected during 1939. Until proven otherwise, I believe Laugier’s version of events. At any rate, these modifications were already in place when acquired by Madame Marguerite Schneider on behalf of her lover, Monsieur Rene Chatard, on the 26th of March 1952. Rene Chatard was a most fascinating character; a serial philanderer, he kept his wife from finding out how many Bugattis he owned by registering them in the names of his mistresses! On the evening of the 22nd of August 1955 Rene Chatard and another of his mistresses, one Jeanine Vacheron, died in a collision with a train at a railway crossing called “de la prise d’eau” situated one and a half kilometers northwest of Gien on the Lorris road. It took ten years of legal wrangling before the remains of 57473 was officially acknowledged as the rightful property of Mrs. Marguerite Schneider. She sold the remains of the car to a scrap dealer in Gien. It was at this scrap yard that a young engineer and Bugatti enthusiast, Paul-Andre Berson discovered 57473 and over a period of a year managed to salvage the original chassis, engine, gearbox and what remained of the body. He then set about recreating 57473 but seems to have used mostly parts from other cars, only using original components if, so it seems, they escaped the fatal accident unscathed. According to Dr Simon, when Mr. Berson’s car was examined by David Sewell and Christian Huet they concluded that only the De Ram shock absorbers could be confirmed to be original to 57473. Which would seem to indicate that very little of the original remains were incorporated in Mr. Berson’s rebuild. This is borne out by an article written by Mick Walsh in the May 2007 edition of Classic and Sports Car. The following is a quote from his monthly column “From the Cockpit” page 35. “Last year the Atlantic changed hands, but only after Swiss dealer Lukas Huni had engaged respected Bugatti enthusiasts to verify the car’s provenance. They tracked down Berson, who unearthed all the original parts he felt were beyond saving including much of the crumpled left side, the engine and ‘box. Priorities have changed since that rebuild and Huni has acquired all the parts for another major restoration. Like pieces of a chopped-up old master, the remaining Atlantic sections will be incorporated into the body. The plan is to return the car to its original Jean Bugatti style rather than the later incarnation when customized by Figoni between 1939 and 1946,” According to Mr. Walsh this restoration has been entrusted to Paul Russell. Perhaps he will do better this time than he did with 57591, after all, originality is of much greater importance now than it was in 1991. Matthews was told by Berson that no steel parts were recovered, therefore, no chassis was recovered. Hmmm, time will tell no? In any event, the rebirth of 57473 to the specification as first ordered by Jacques Holzschuch is something to be celebrated. 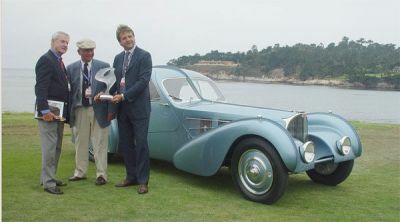 A final thought; Mick Walsh writes: “I’ll put money on a third Atlantic winning Pebble Beach before the end of the decade.” Keep in mind that Mick Walsh accurately predicted both Sam Mann’s Portout bodied Delage D8-120 Car of the Show (2005), and this years winner, the Duesenberg Mormon Meteor, and you can see why I am looking forward to 57473’s post restoration unveiling. At Pebble Beach 2008? From an amateur historian’s point of view this is the easiest of all of them. Its history is well known with few owners and it has never been crashed, modified or ruined until Ralph Lauren ordered Paul Russel to restore the very life out of her. Painted a thoroughly unoriginal black, with equally unoriginal black leather seats and carpets and sporting the most unappetizingly clinical restoration, it duly took top honors at Pebble Beach in 1991. But let us not dwell on such mindless vandalism, let us instead celebrate EXK 6 as she was for most of her life. Painted a rich sapphire blue, no wheel covers and sporting blue painted wire wheels, 57591 was delivered to her first owner, Mr Richard Pope during June of 1938, having ordered her on the 31st of March of the same year. Although there are few remaining mysteries after she was delivered, there remain some discrepancies with the dates before she was delivered. If Pope ordered the car on 31/03/1938 why was it already being road tested during October of 1937? There are two possible explanations I can think of. Both Mr N Embericos and Lord Cholmondley showed interest in acquiring an Atlantic; the Embericos car, 57375 ended up being bodied by Corsica. Registered DGJ 877 this elegant roadster is still owned by Mr. Nigel Corner. (I think) It is possible that work was started on an Atlantic body before Embericos decided on Corsica instead, but that still does not explain why it was then fitted to 57591. On page 287 Dr, Simon argues that 57612 was to be an Atlantic for Lord and Lady Cholmondly. The manner of its finishing is very reminiscent of the Figoni bodied saloon 57739 delivered to Lady Cholmondly. Was this delivery instead of an Atlantic and would this explain why, when Richard Pope ordered his Atlantic, there was already a finished, or nearly finished car at the works? This still does not explain why the car was only delivered seven months after it was ordered. A lot has been written about 57591 being slightly taller than the others, to provide Mr. Pope with the additional headroom he required., but we are only talking about 12mm or so; surely the extra space could have been found with a lot less effort by simply lowering the seats? About the only thing this author is sure of, is that Mr. Pope was persuaded to order an Atlantic due to the devaluation of the Franc, reducing the price of Bugattis delivered to Britain significantly. The T57S was reduced from 1100 pounds to 860 pounds for instance. But that still does not explain why 57591 was being road tested in Oct. 37. Any explanations will be gratefully received. Richard Pope owned 57591 for nearly thirty years before selling it to Barrie Price who immediately picked the most dreary of all Bugatti blue shades to celebrate his acquiring EXK 6. (Actually this is not true; he only stripped it of its original color after he put the car in a ditch during a rally in 1970. What remains true is the dreariness of the new color and the removal of all traces of the original) Why this was thought necessary I do not know, but it leaves us with no way of identifying the exact shade of dark blue first used. While it is fact that both Laugier and Simon states the original color to be a non-metallic blue, and both state quite unequivocally whenever the color was metallic; 57602 and 57533 for instance, I maintain still that the deep sapphire blue was a metallic blue. As proof I submit the photo on page 261 of B. Simon. Standing next to EXK 5 (57592) the intricate play of light would seem to indicate a metallic hue; compare that with the defiant red of 57592 and notice how much less “complex” the color seems. This would also explain the very dark tone of the photo taken sometime during Mr. Pope’s ownership. (Laugier p.232) Flimsy evidence I agree, but keep in mind that I am a most arrogant human being, so therefore I shall state as a matter of fact (Very well, a matter of opinion then) that EXK 6 was originally painted a rich dark metallic blue. Mr. Price could not have been very happy with EXK 6 as he seems to go to some length to complain about everything from the noise to the loss of performance due to the weight of the coachwork. Was the Atlantic body that much heavier than an Atalanta? ( Matthews state that Price actually loved the Atlantic, but let us not forget that Mr. Price did write a thoroughly under whelming book about Types 46&50. My opinion stands.) Not that it matters, Price duly sold her to well known British industrialist Anthony Bamford after nearly a decade’s suffering. Bamford had it lightly restored, changed the color to a darker, non metallic blue and duly fitted chrome wire wheels. He did the same to the Count Trossi SSK, by the way. Acquired by Tom Price in 1981, he contacted Mr. Pope, who was 80 years old then, and he was able to provide Mr. Price with valuable feedback during the next restoration. In 1988 Mr. Price decided to sell most of his cars because he felt they were not being used properly. Ralph Lauren bought 57591 for a vast sum of money and it was duly delivered to Paul Russel on July 11 1988. Laugier quotes a long report prepared by Paul Russel during the restoration of 57591, but the egregious change of color is not mentioned. The one advantage I have is that I do not have to keep quiet about the immorality of the modern Bugatti collector seeing that I am never going to need the cooperation of the Laurens and Kellers and Mozarts of this world to complete any research. Both Mr. Laugier and Dr Simon had to treat Lauren with extreme obsequiousness to obtain access to the car. Thanks to their hard work I am now in a position to pontificate to my heart’s content. Comparing images of EXK 6 both before and after Lauren’s rebuild, I am struck by how clinical she now looks. The last vestiges of her hand crafted look has been wiped away by careful adjustment of the original metal. The shut lines looks like they have been cut by laser, and the entire body is now flawlessly smooth. It looks mass produced. It was painted black. The interior is black. It destroyed the subtlety. Does this matter, I hear you ask? Yes it matters a great deal indeed, it matters as much as good manners and wearing clean underwear, that’s how much it matters. And so continues history. The above must not be seen as the definitive story of the Atlantics but rather an introduction. If the incompleteness of my writing drives only a single reader to deeper research, I shall be most pleased. Of the five cars built only two remain in original condition and they may very well soon be joined by 57473. The Aerolithe 57533 and the second Atlantic 57453 are not known to have survived. But many replicas have been created and if imitation is truly the sincerest form of flattery then these replicas serve only to celebrate the originals. To list Pierre-Yves Laugier’s Bugatti 57 Sport simply as part of a bibliography is to sell it short. Without Laugier there would have been no chapter on 57453 and everything about 57473 would have been wrong. My entire article is primarily based on this remarkable book and I cannot recommend it highly enough. Bugatti by Hugh Conway & Jacques Greilshamer. Great Marques: Bugatti by Hugh Conway. The Greatest Cars by Ralph Stein. Great Cars of the Golden Age edited by Kevin Brazendale. Aerolithe presents big challenges by David Grainger, published in BugattiPage. Last edited by Herman on Mon Dec 03, 2007 7:32 pm, edited 2 times in total. Last edited by bugatti69 on Wed Dec 05, 2007 11:38 am, edited 2 times in total. Yes Bugatti69, 57333 is most definitly a mistake. I refer to the Aerolithe as 57531 mostly as a convenience; I am not sure how long it actually carried this chassis number. Your confusion about 57453 and 57473 is quite understandable and as soon as Herman has placed the photos with the right chapters, things should be slightly clearer! It's probably a good thing that myself and Herman live on two separate continents, don't you think? Il y a déjà beaucoup de confusion dans les conclusions qui sont souvent des hypothèses, données à l'appui de documents qui eux mêmes n'ont pas été vérifiés, y compris les documents de Molsheim. Il serait intéressant de connaître la chronologie exacte des numéros d'immatriculation par rapport aux modifications apparentes sur les photos, notamment pour #57453 et #57473. Par exemple si 3974 RK 7 est antérieur ou postérieur à 9219 NV2, à 5800 NV3, à 1521 NV4. Aucune photo connue de #57473 avant son accident ! Comment était elle avant ? La 57453 n'existe plus et 57473 apparaît ! Coincidence ? Beaucoup de questions sans réponse, seulement des hypothèses. There is already much confusion in the conclusions which are often assumptions, given in support of documents which them same were not checked, including the documents of Molsheim. It would be interesting to know the exact chronology of the serial numbers compared to the apparent modifications on the photographs, in particular for #57453 and # 57473. For example if 3974 RK 7 are former or after 9219 NV2, to 5800 NV3, 1521 NV4. No known photograph of #57473 before its accident! How was it front? The 57453 does not exist any more and 57473 appears! Coincidence? Many questions without answer, only the assumptions. Last edited by bugatti69 on Sun Dec 02, 2007 9:02 pm, edited 1 time in total. Allow me to answer the second question first: The photograph, featured on the home page of this website, next to the announcement of my article, was taken on the 31st of March 1937. This photo depicts Atlantic 57473 when entered in the Cannes Councours by Jacques Holzschuch. The lady featured is Mrs Holschuch. Her name was Yvonne and she was a rider(?) in the Pinder Circus. Comparing this car with 57453 (All other photos of a black Atlantic registered as follows: 5800 NV 3 ; 9219 NV 2 and a single photo with 1521 NV 4. More on this later) the differences are clear to see. I am not just referring to the obvious differences like the headlamps, central spot-light and front bumper as fitted to 57473, but closer examination reveals slight, but definite, differences in the rake of the windshield and the curvature of the roofline. 57473 fitted with engine 10S was completed 01/12/1936, registered new in Paris 09/12/1936 in the name of Jacques Holschuch of 8 Avenue Gourgaud, Paris XVIII (there's a little "e" after the XVIII but I do not know how to make my keyboard do that). The registration was 3924 RK 7, it was picked up by Mr & Mrs Holschuch on 13/12/1936 having waited since 11/12/1936 while the factory performed some final road tests. Skip forward to 31/03/1937 and that is when the above mentioned photograph was taken. The registration was still 3924 RK, the Holschuch couple kept 57473 for nearly ten years and it was only reregistered MC 2288 in Monaco during 1946 to a Jules Boichard. Because 57453 disappeared in 1941 the further, and well known, history of 57473 need not concern us. A factory memo containing the list of T57 engines lists "2SC" with ch no's 57453 - 57222 & 57454. This corresponds with the sequence of registration numbers: 5800 NV 3 then 3219 NV 2 and then 1524 NV 4. The last mention of this car can be found on a list of cars being transported to Rue Alfred Danat in Bordeaux. during February 1941. "Engine 2CS , 57454, Atlantic Coupe 1244 W 5" This is the last evidence left of 57453, engine 2SC. Why this last registration number is new and the ch no still 57454 as when allocated to 1524 NV 4, I do not know. I hope this has cleared matters up to your satisfaction and have fun comparing the dates. Thank you Johan for all these precise details. The registration 3924 RK7 was indeed allotted to the #57473 (Holschuch) and not to # 57453. Atlantic with the Councours of Cannes is well the #57473. Make your dream devour your life, so that life doesn't devour your dream. Thank you for your kind words, but I got 2 of the dates horribly wrong. 57453 was shown at the Nice Auto Show from 08/04/1937 until 18/04/1937. I wrote 1936 - sorry. I still have trouble understanding the relationship between works chassis numbers and their respective registration numbers. For instance, would the factory have stamped the number 57453 below the engine number (on the actual engine and on the plaque fitted to the firewall) And if the answer is yes, was the subsequent ch no's (57222 & 57454) stamped over it? Is it correct to refer to 57453 by its ch no? Would it not be less misleading to refer to it as the works Atlantic with engine 2SC? I've just succeeded in confusing myself even more. Can anyone clear things up for me? Nothing is too beautiful... nor too expensive! Johan i would like very much to commend you on your work, it is informative, amusing and graphic. 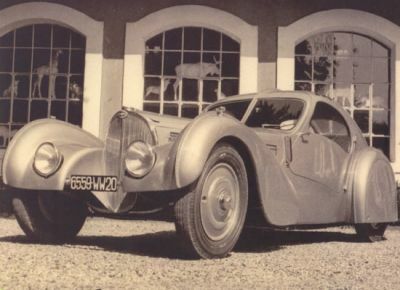 My interest in #2SC stemmed not from Bugatti itself (originally) but rather 3 people, Robert Benoist, "Eve" Williams (Formerly Yvonne Aubicq) and the illustrious William Grover-Williams. I read a book called Early One Morningby a chap named Robert Ryan which is a semi fictitious book about the life of William Grover-Williams. 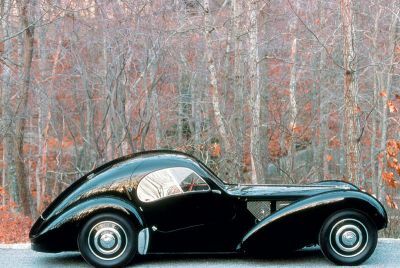 In it is mentioned (quite substantially) is a sleek black Bugatti Atlantic and that's where my love Affair with Bugatti began. When i started researching the cars i was most surprised (considering the book was supposed to be fiction) to discover that both Robert Benoist and WGW both had the use of #2SC quite a lot. I do have a couple of questions regarding your essay which is this. You mention that you cannot tell if #57453 had the chromium plated mud guards as Mrs Williams was blocking the view on the two pictures...i can say that there is a third photograph and the mud guards are most certainly not fitted. Why would Ettore / Jean not fit or remove the mudguards for the catalogue photoshoot? Also where would i be able to get access or get in contact with someone who had access to Molsheims archives? Something has been bothering me about the fact that the car was last heard of on a shipping manifest to Bordeaux. My thanks again for reigniting my interest in both this car and Bugatti. Nobody really owns a Bugatti they merely look after it for the next generation. Last edited by Uwe on Fri Jul 14, 2017 8:34 am, edited 1 time in total. I love the T57S Atlantic. It looks very royal and perfect for a wedding. I would merely like to put forth the opinion that painting an Atlantic black is not quite the act of criminality that Johan suggests. There are several justifications for this view: first, 2 of the 4 Atlantics (57453 and 57473) were painted black originally. Second, 57591 was never painted a factory color but rather a sapphire blue requested by its first owner, Mr Pope, to match the color of one of his wife's rings or dresses. It later underwent an incorrect restoration to the interior and was painted a lighter blue. Much of Russell's work on the car was the correction of previous work. A car 75 years old needs new paint; the choice of black is justified by the black of its two siblings. As to the quality of the paint job - should the owner of such a car really search for inferior paint to avoid its being called "better than new"? Much more restoration was done for Dr Williamson's car, 57374, because, in his own words, the car "had been butchered" by several previous misguided alterations, which I'm quite sure you know. One more thing: 57473 will NEVER really join 57374 and 57591 because of the horrific damage done to it in the 1955 accident. It's at least 90% new from what I understand, and can't possibly be considered original. Russell did a superb job of re-creating it to the ALREADY ALTERED FORM it was in before the accident, but it's a recreation - an almost entirely new car with some original bits. I'm sure many of you are already familiar with all of this, but I believe that some of the nuances of the matter warrant re-stating from time to time.